Editor's Summary: Acer announces the world’s first touchscreen Chromebase for meetings, an all-in-one, dedicated video conference system designed for small spaces such as phone booths, huddle spaces, and desktops; The Acer Chromebase for meetings features the largest screen of any Chrome OS device and includes four microphones and two speakers for optimum audio performance; Chromebase for meetings now supports 25-person Hangouts across a variety of devices such as laptops, tablets, or smartphones, for anyone with a meeting link. 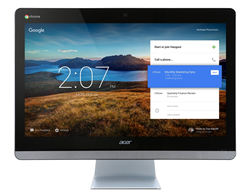 Acer debuts the world’s first touchscreen Chromebase for meetings (CA24V). The all-in-one video conference system is available at $799 in the US, which includes the first year's $250 support fee. The latest addition further expands Acer’s industry-leading Chrome OS device portfolio, which currently includes Chromebooks, Chromeboxes / Chromebox for meetings solutions, and Chromebases . According to data from Gartner , Acer Group is the world’s leading Chromebook brand with over 33 percent market share in 2015. Designed for videoconferencing, Acer’s Chromebase for meetings features the largest screen of all Chrome OS devices on the market, a 24-inch Full HD (1920 x 1080) display with IPS technology, reproducing consistent and accurate colors at up to 178-degree wide viewing angles. An array of four microphones and two speakers ensure that participants can hear and be heard clearly, while an adjustable HD webcam and a chassis that easily tilts from - 5° to 30° allows them to be framed perfectly on the call. The Chromebase for meetings solution, utilizing Google Hangouts, can host videoconferences with up to 25 participants across a variety of devices such as laptops, tablets, or smartphones. With a meeting link, colleagues, customers, or partners can join in the call whether in a conference room, at home, or on the go. Enterprise IT administrators can deploy and manage hundreds or thousands of Chrome devices with ease through Chrome Device Management, significantly reducing the workload of technical support and consequently reducing the total cost of ownership (TCO) for organizations. The Chromebase for meetings solution also integrates with other videoconferencing systems and existing phone systems. The Chromebase for meetings, which runs Chrome OS, will receive automatic updates every six weeks to ensure it is always secure and up to date. All data, whether stored on the Chromebase or in the cloud are encrypted and protected by its TPM (Trusted Platform Module) 1.2 chip, which securely generates and stores cryptographic keys. Each time Chrome OS boots up, Verified Boot checks the integrity and validity of system files to ensure they have not been tampered with. The Chromebase for meetings is available at $799 in the US, which includes the first year's $250 management and support fee. It is also available in Canada, UK, Ireland, and Australia. Customers in the US can sign up to apply for a free trial of the Chromebase for meetings solution. Exact specifications, prices, and availability will vary by region. To find out about availability, product specifications and prices in specific markets, please contact your nearest Acer office or authorized reseller. Chrome devices for meetings allow enterprises to keep things simple. There’s very little infrastructure needed, and no cables are necessary since they work with wireless connections. Setup is fast and the integration with Google Apps and Calendar makes joining meetings as easy as clicking a button. Screen sharing makes collaboration easy. Please visit http://www.google.com/work/chrome/devices/for-meetings/ for more information. 3.) All brands and product names mentioned herein include trademarks of their respective companies and are used solely to describe or identify the products. 5.) Limited offer subject to approval, terms and conditions apply.